The Middle East is known for luxury and luxury brands. 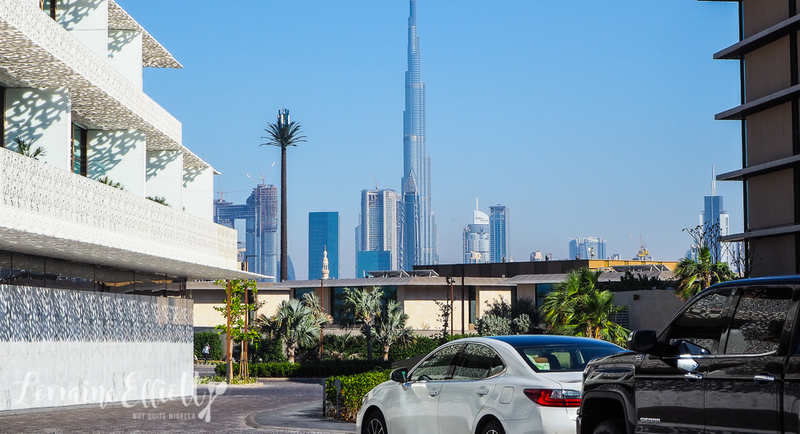 Take a step inside some of Dubai's highest end hotels where a jar of Nutella style spread will set you back $80AUD or take a tour where you can ride a camel and feast on royal private property! 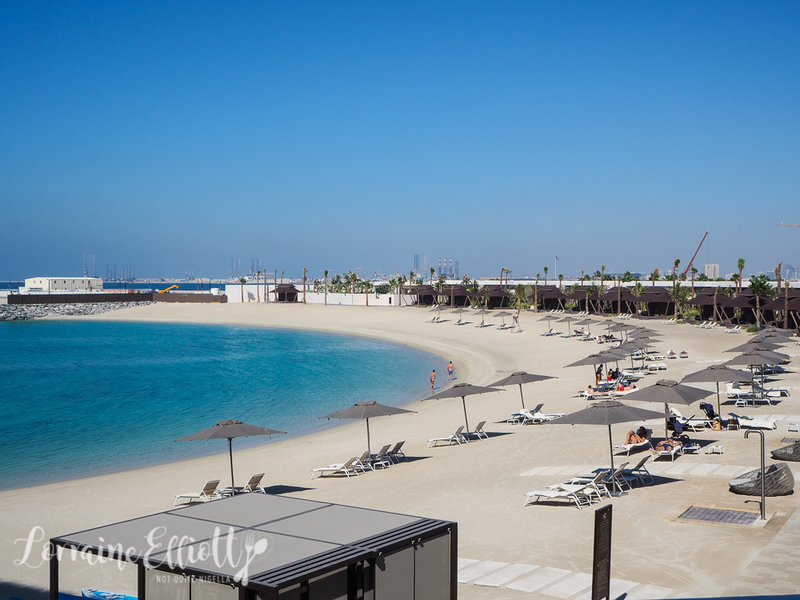 Dubai has no shortage of luxury hotels and the Bvlgari Dubai is the 5th and newest hotel location for the Italian brand. 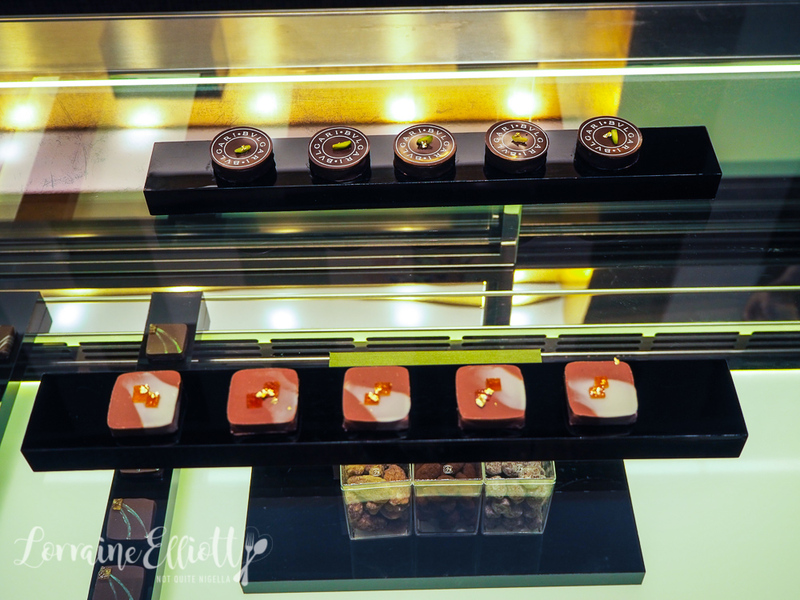 The hotel boasts an exquisite chocolatier, help yourself lolly bar in the lobby and seamless service. The Italian restaurant Il Ristorante is run by all Italian staff and the brand's passion for all things Italy is only matched with Middle Eastern generosity. Il Ristorante sits facing the water. There is an indoor and outdoor section of the restaurant and we take a seat inside where framed photos of Sophia Loren and classic movie stars line the restaurant. As expected, the theme is luxurious elegance. 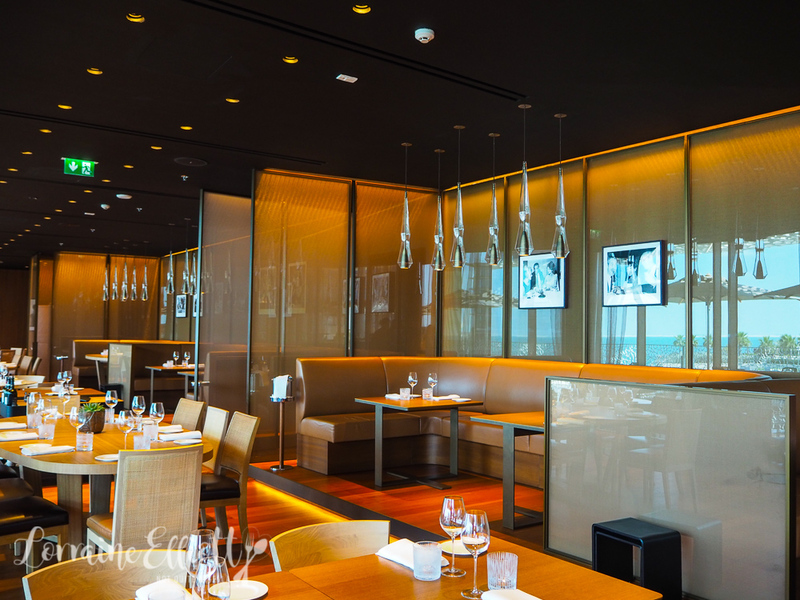 The chef patron is Niko Romito, a 3 Michelin star chef. First to arrive is the trio of bread. 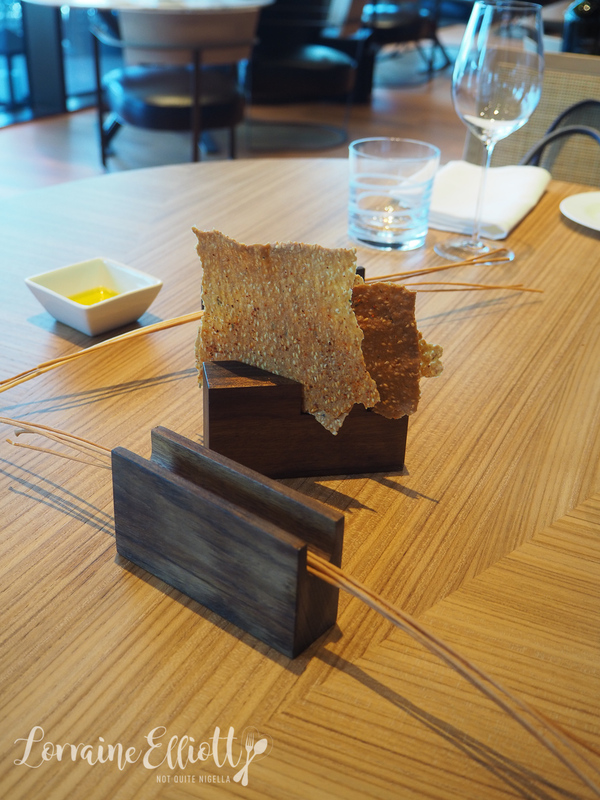 There are super fine, hand rolled spaghetti-thin honey grissini that are impressively long as well as a paper thin cracker dusted with chilli. Next is a crispy crusted potato bread that is perfect for dipping in the extra virgin olive oil. We are having an abbreviated version of the Menu Condivisione which is AED 450/$160AUD per person. 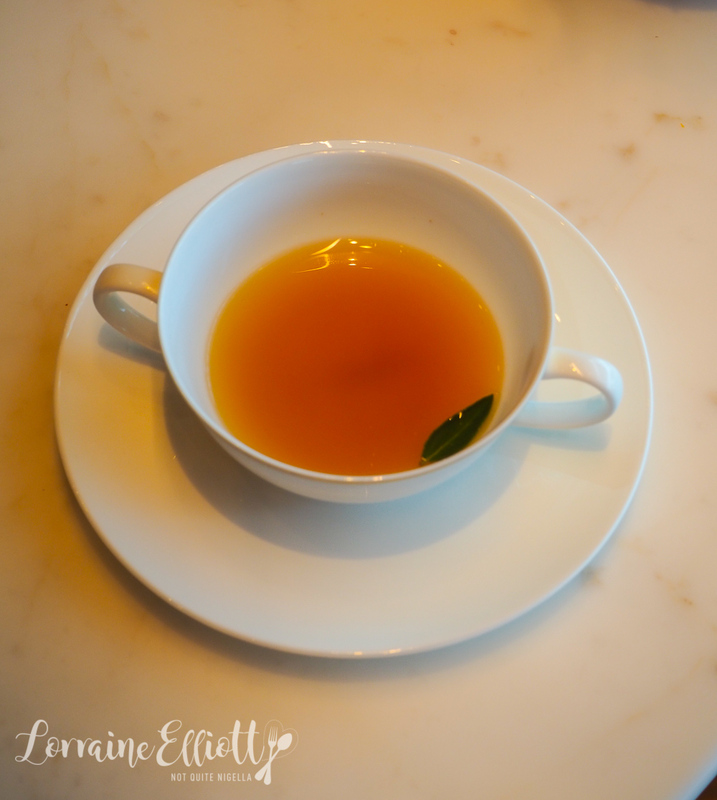 We start with a cup of consomme. It's extracted from carrot, onion and celery or mirepoix but without any water added. We expect it to be mild but it has a surprising intensity of flavour. Our primi course is the basil linguine. 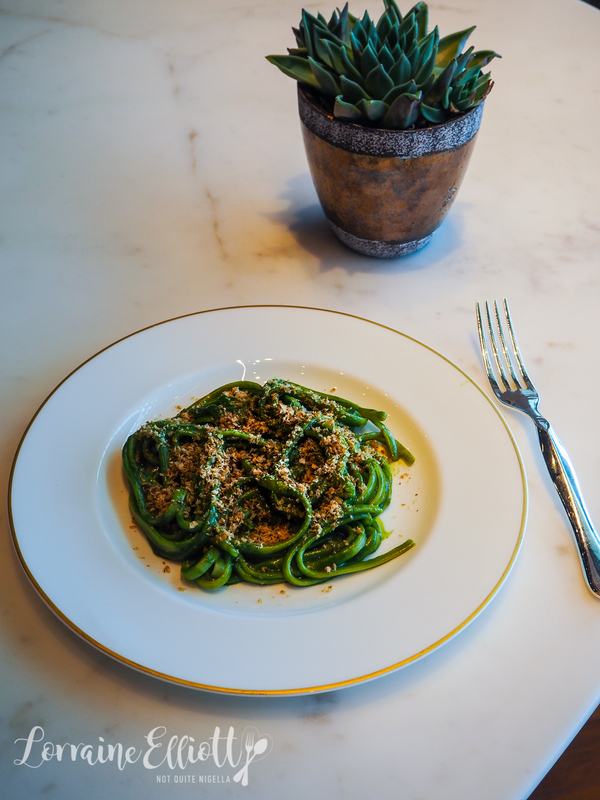 At first sight one might think that it is spinach linguine but the green comes from the perfectly pesto coated linguine strands. On top is shaved hazelnuts. It's fragrant and smells of summer with the basil and the pasta is al dente. 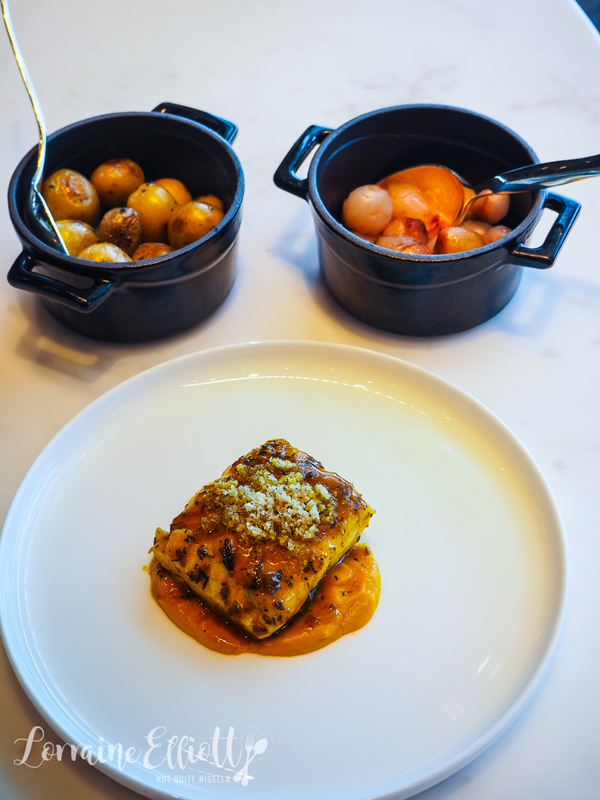 Our secondi course is monkfish with a cacciatore sauce with carrot puree and breadcrumbs. I like the firm texture of monkfish as it reminds me of lobster and the sauce is luscious. They pair this with tiny pan roasted agrodolce cipolline onions and the tiniest roast baby potatoes. And for dessert? Their layered version of a tiramisu mousse. 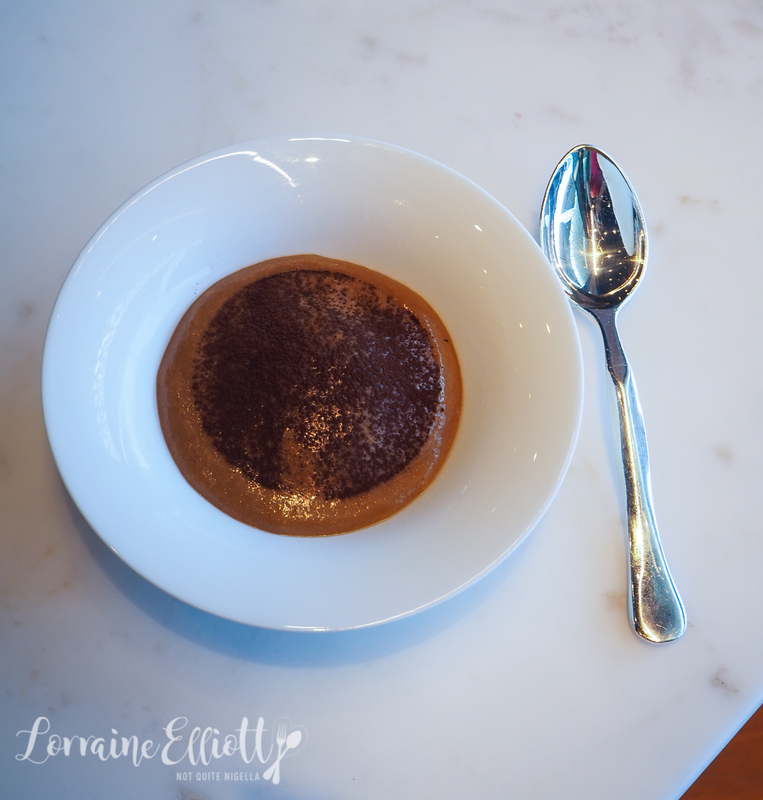 It is light as air with a chocolate feuilletine layer, mascarpone, biscuit and the lightest coffee mousse on top. 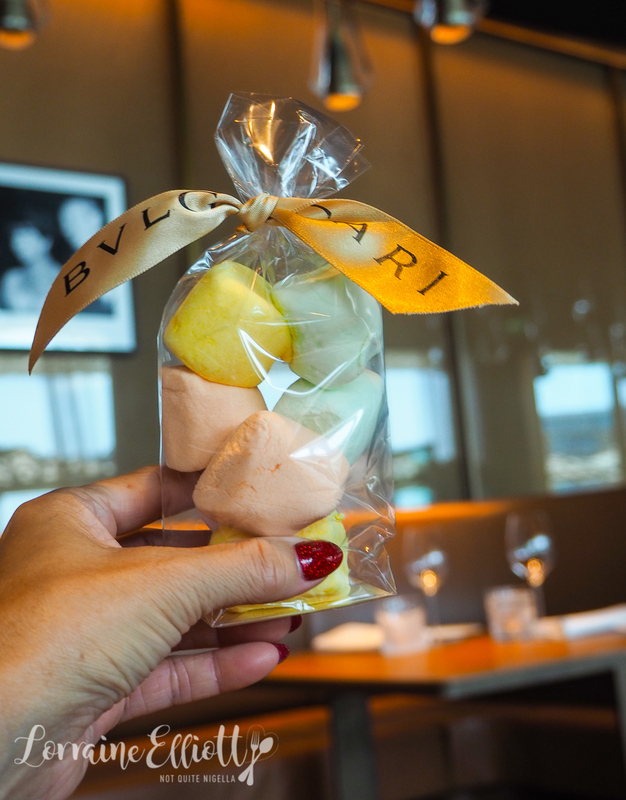 And before we leave we take a peek at the Bvlgari chocolatier. All chocolate is made on site by the duo of chocolatiers. 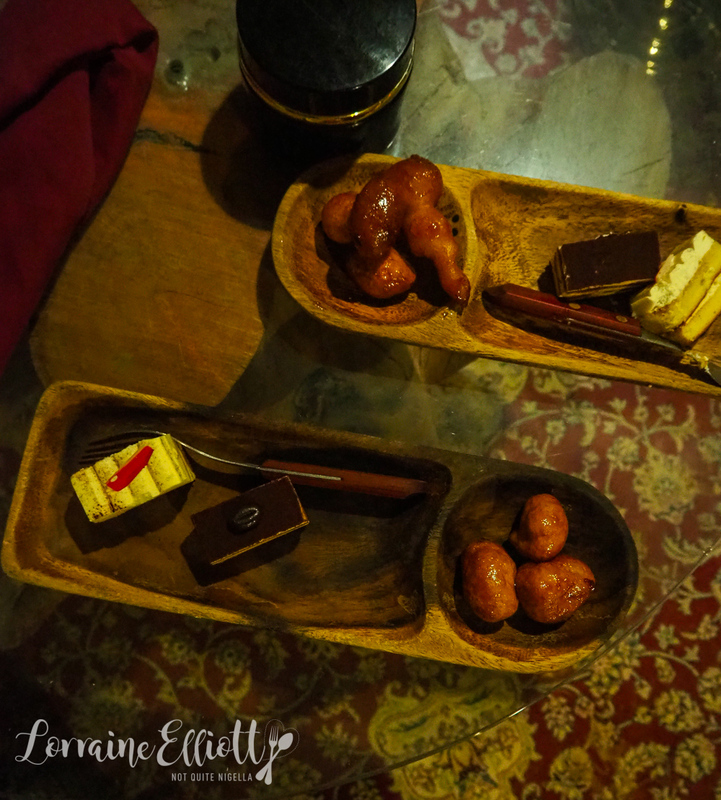 They import the beans from all over the world and produce the chocolate here. The shop resembles a fine jewellery boutique. The most popular is the signature date and pistachio while the saffron and praline is my favourite along with the gorgonzola and orange. Each chocolate ranges from $10AUD-$20 and because the flavours are hand made and layered with each flavour each chocolate can take up to three days to make. And if you're feeling flush? Try the Bvlgari version of Nutella. One very chic looking jar will set you back $80AUD! Sometimes it helps to have a well connected boss. 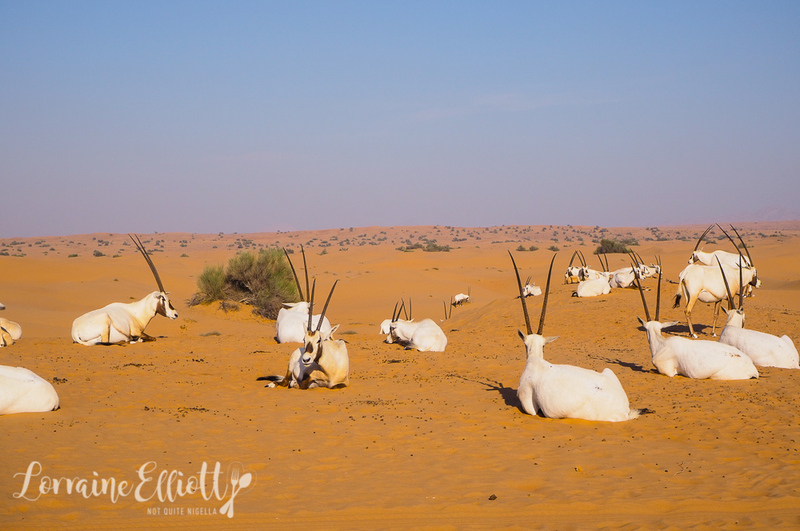 Platinum Heritage is an upmarket tour company owned by Dubai royalty and the tours take place on royal land. 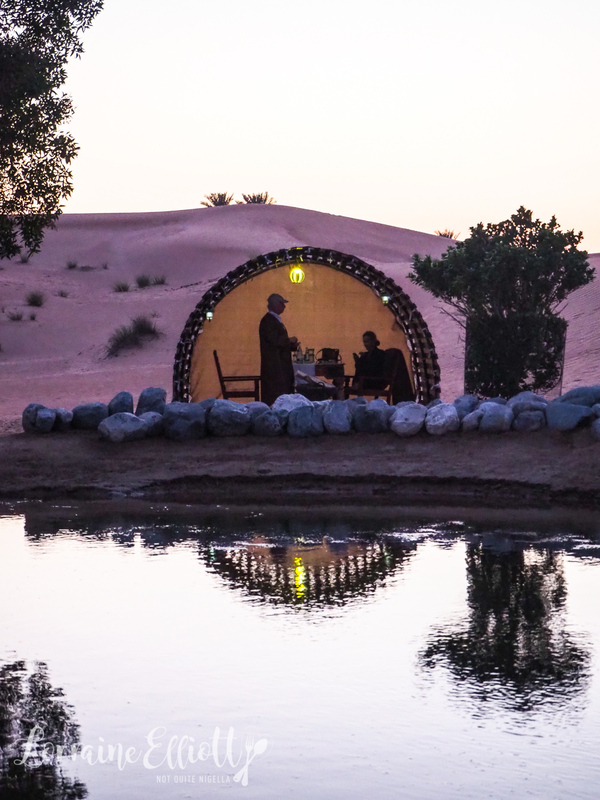 The company is a Green Tourism Award winning one where dune bashing is replaced by gentler pursuits. 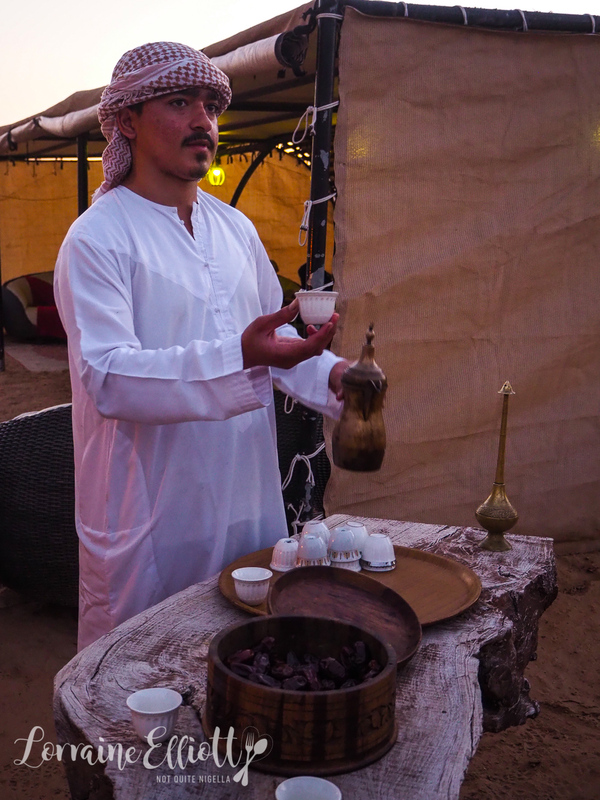 They take people out onto the private property called the Ghost Quarter in the late afternoon for a tour of the desert that involves falcons, photos, a six course dinner and a fire show called the Platinum Luxury Desert Safari. This is after a pick up from our hotel in a Range Rover add a short 30 minute drive out to the desert. When we arrive we first have to attend to our attire. The keffiyeh or head scarf is a practical one in the windy dessert. It helps keep the hair tidy but also sand free. We choose a colour that we like and our guides wrap us in our keffiyeh. 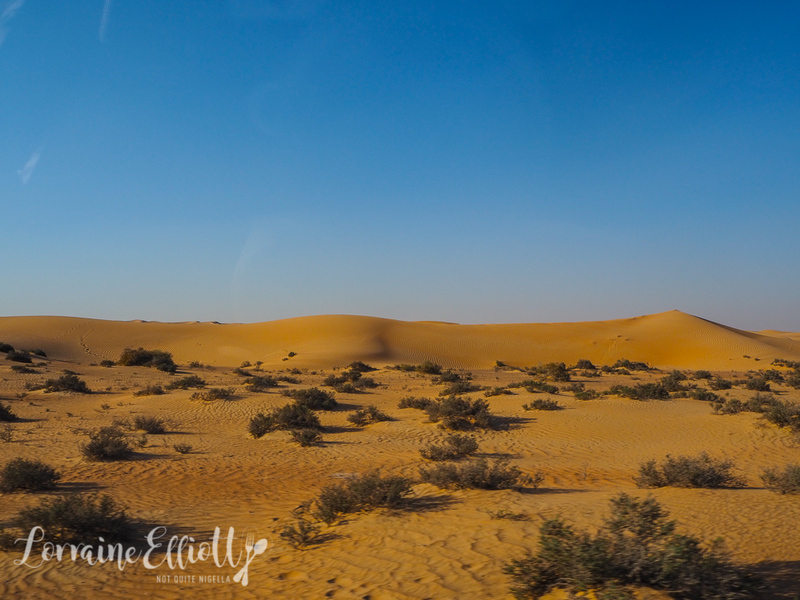 Then the platinum heritage guides take us to the rippled sand dunes to take photos. There's a drone and a team of photographers waiting too. This is followed by the falconry demonstration between falcon Banshee and her trainer Cesar. He explains that they are lazy birds by nature (which is probably a good thing that they enjoy such high status here). Travel anywhere in the UAE by first class and your seat mate may be a falcon. Although not native to the UAE the falcon enjoys a revered position within royal and upper class households with falcons hundreds of thousands of dollars. The relationship between a falcon and its owner is an interesting one. The phrase "Out of sight, out of mind" could have been coined about a falcon. Once they're flying and you're out of sight they will simply forget about you. It's only when they can see you that they will come back. The owners and trainers play a dance of unrequited love with the magnificent bird and sadly their love for the bird will never been returned. We sip sparking apple and date juice (there's no alcohol allowed here on the sheik's property) and dine on crackers topped with smoked salmon, caviar, gherkin or marinated beef, cheese broccoli and ratatouille and there is also a vegetable bite with mixed vegetables with black olives. From around a corner a caravan of camels comes into view. It's our time to climb on and take a ride on these magnificent beasts. A camel snuggles me gently and I decide that this is my camel (we had a moment) and I climb on and we take a 15 minute ride down gently sloping sand dunes. We end at our destination for dinner where we are offered cups of coffee. 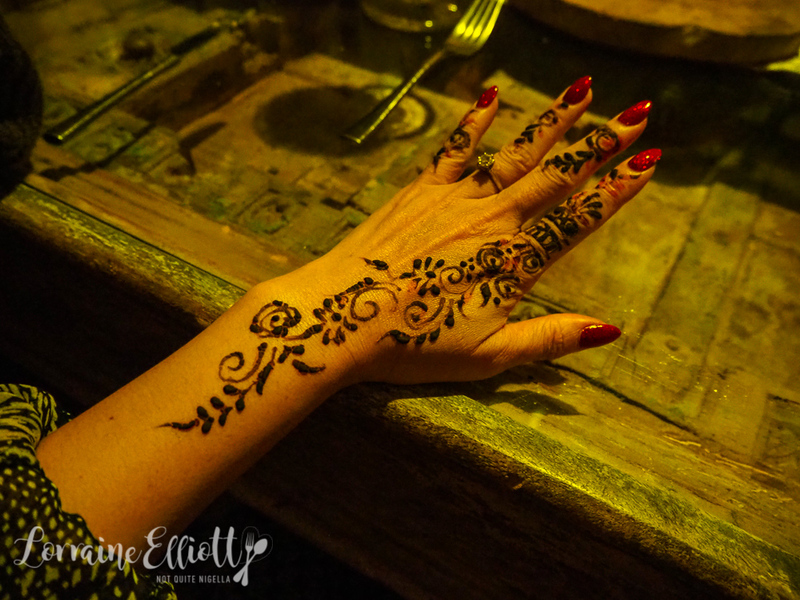 A henna artist traces patterns on our hands before we all make our way to our own private tent. 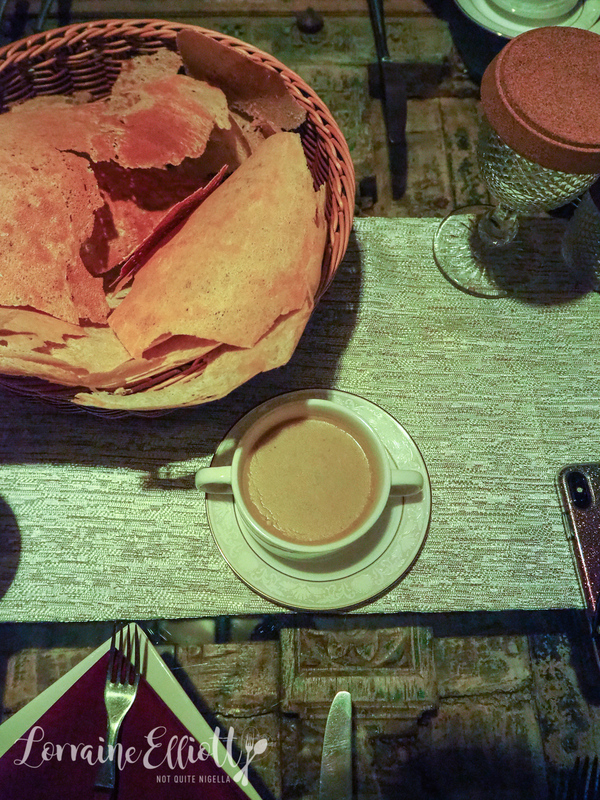 Bowls of Shorbat Adas a lentil soup are served along with and breads and paper thin crackers which we are to crumble into the soup. 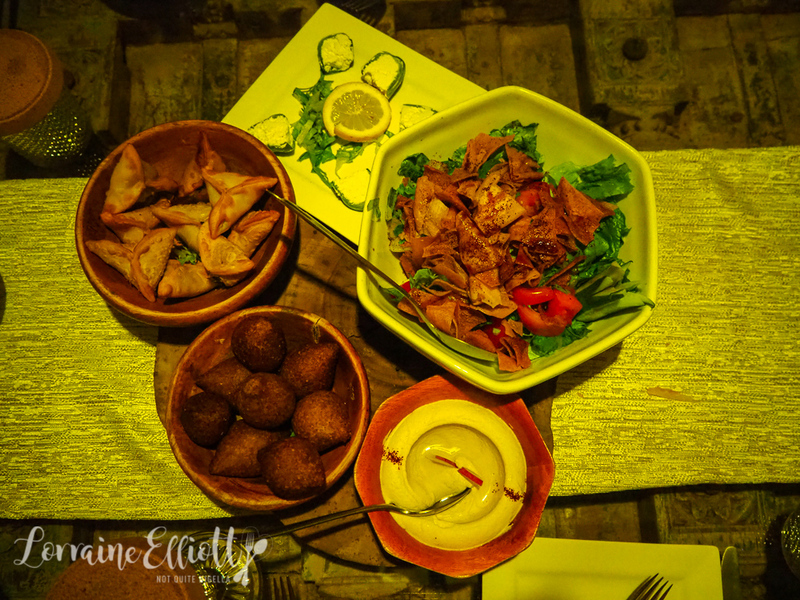 There's also a spread of fattoush salad, stuffed peppers, spinach sambousek and hummus. 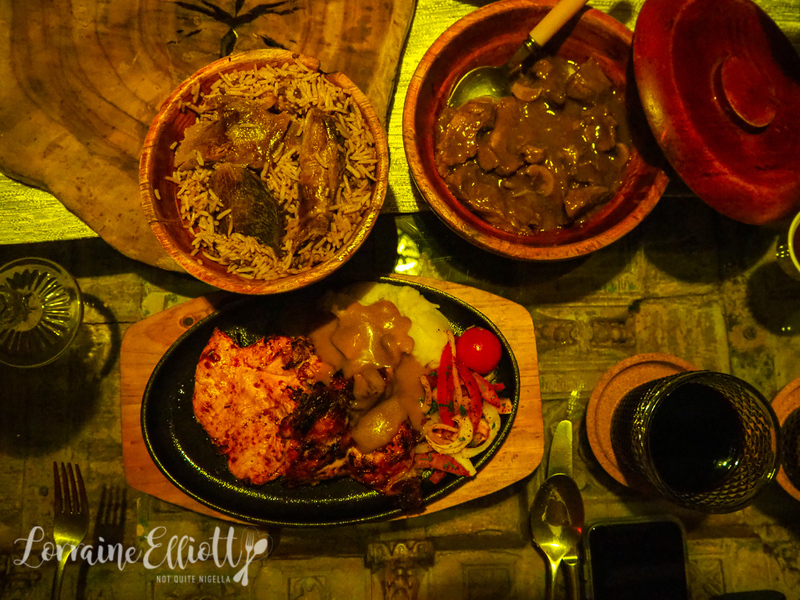 The Australian Angus steak topped with mushroom sauce with mashed potato is delicious but I love my choice of Arabic spiced half grilled chicken which is succulent and flavoursome. I shrug on a fur lined coat to keep the chill away while others puff away on fruity shisha pipes. 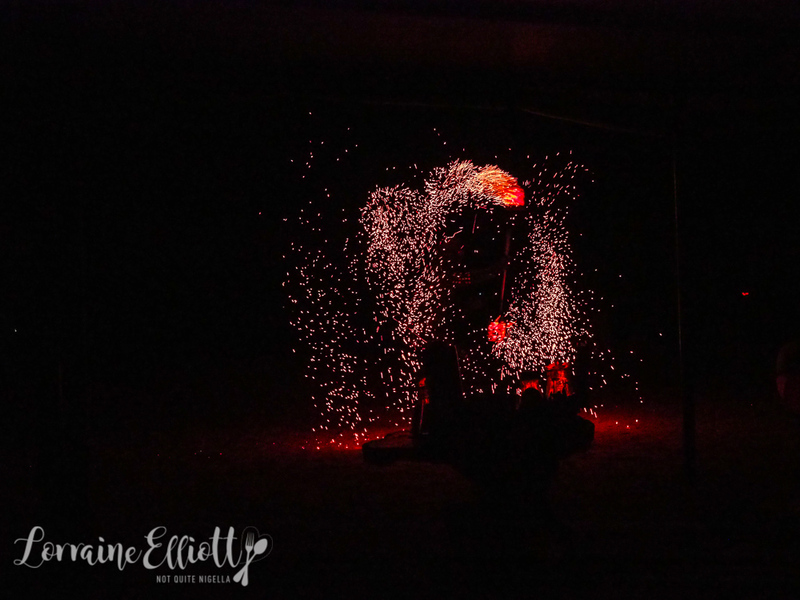 Dessert is served alongside a Flaming Sands of Arabia fire show. 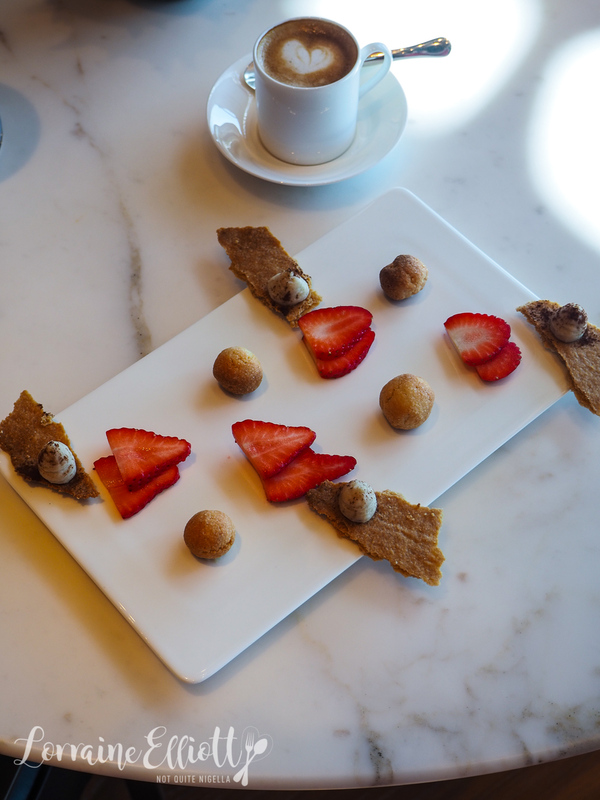 The striking show plays while we feast on legimat or light as air Arabic style donuts served with small French patisserie style cakes. The legimat are drizzled in honey and date syrup. They're designed to be eaten in one single mouthful but I dare anyone to stop at one. So tell me Dear Reader, would you buy the Bvlgari version of Nutella? 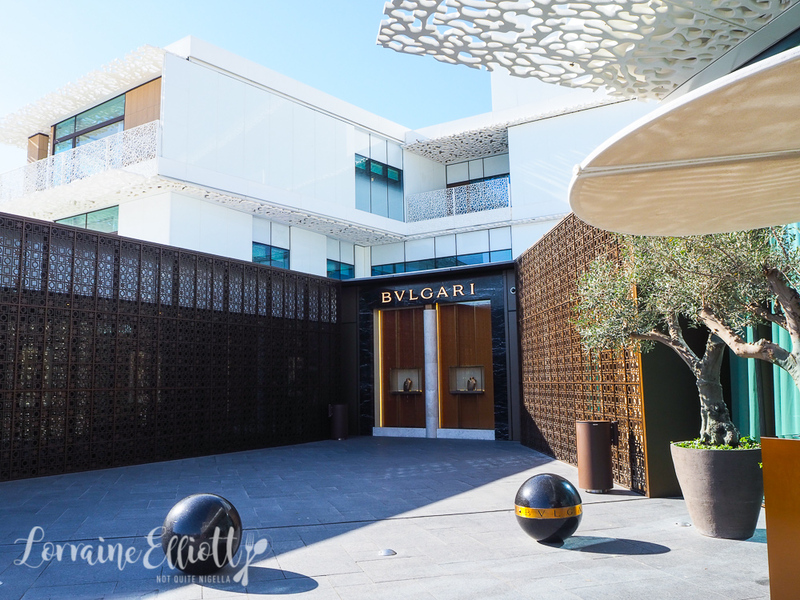 Have you ever stayed at Bvlgari or another designer label hotel? Do you have a favourite designer brand? 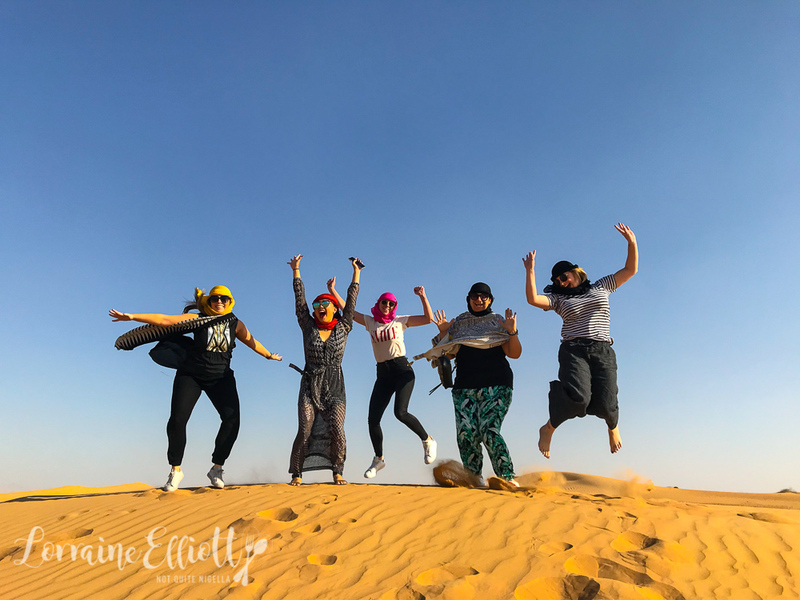 travelWhat To Do With 24 Delicious Hours in Dubai!